Here are the top over the counter (OTC) drugs you can give, and a few you definitely can’t! Plus some guidelines for safe and appropriate use. See full disclaimer below. Antihistamines can be used in dogs to reduce the signs of allergy. The following antihistamines appear safe in dogs (note that Benadryl is no longer sold in Australia as diphenhydramine tablets). These doses have essentially been worked out by trial and error and often scaled down from human doses. Bad stuff: We don’t know why, but dog allergies respond very poorly to antihistamines. Even the best (cetirizine) only helps 20% of dogs. The response may improve if combined with EFAs (see below) and it’s worth trying a few before giving up. Non-steroidal anti-inflammatory drugs like these work well in humans with minimal side-effects. This means we get a lot of questions about using them in dogs. Bad Stuff: Please don’t use these drugs at all. Human anti-inflammatory medications are almost universally toxic to dogs. A single dose of Nurofen or Voltaren can be fatal, and survivors are left with permanent organ damage. Even aspirin, although used in the past as a blood thinner, is not recommended. The veterinary pain medications are the only safe option. Read about effective treatments for arthritis in dogs here. If your dog has taken any human anti-inflammatory, contact a vet immediately. See also paracetamol below. Mild motion sickness in dogs can be treated with Phenergan or Benadryl antihistamine tablets (see doses above) which may also cause mild drowsiness. Ginger products used for people also appear safe. Bad Stuff: Most dog owners don’t see much success. Nowadays the only good drugs for car sickness are prescribed at the vet. Dramamine was great but was taken off the market due to problems with human abuse. Read a lot more about stopping car sickness in dogs here. Dextromethorphan is an ingredient found in many human dry cough treatments. We often use it to comfort dogs with kennel cough at a dose of 5, 10 or 20mg depending on the dog’s size (usual dose 0.5-1 mg/kg twice daily). Just make sure that the product you use contains no other drugs. Bad Stuff: You need to be 100% sure that the cough can be safely suppressed. Click here for the common causes of coughs in dogs. If it is caused by lower airway infection, heart disease or a foreign body then suppressing it is very dangerous. Even when the diagnosis is confirmed to be kennel cough, antibiotics usually work faster so please see your vet first. PAW Digesticare is an OTC veterinary probiotic and prebiotic food supplement. Combined with a bland diet, it helps restore the normal gut bacterial flora and can assist with some diarrhoeas. We supply either sachets or you can purchase a whole tub. Vets use binding products to help reduce the unpleasant symptoms of diarrhoea. These include bismuth sub-salicylate, kaolin or montmorillonite. All are fairly harmless but you might have trouble finding them as they aren’t used much in people. Bad Stuff: Home treatment is only appropriate for bright and happy, fully vaccinated adult dogs with mild diarrhoea of no more than a few days duration. They need to also have a good appetite and no blood in the stool. Although I understand why frustrated owners may resort to it, there is no place for Imodium in canine medicine. If symptomatic treatment doesn’t work, it’s off to the vet. Epi-otic and similar veterinary ear cleaners are an essential part of good preventive management of problem ears. Aqua ear can be used to dry the ears of frequent swimmers and prevent infection. Except for these, there isn’t much. Bad Stuff: OTC ear drops are over-used and frequently abused. They are only appropriate for prevention, not treatment. None will fix even the mildest problem so don’t be fooled by your dog’s ‘improvement’. They are just learning to live with the pain. Most ear drops permanently damage hearing if the eardrum is ruptured, and are always painful in diseased ears. Human artificial tears and OTC antibiotic eye ointment can be used in dogs. Bad Stuff: The use of these products without a diagnosis masks serious disease and could lead to loss of the eye or loss of sight. Glaucoma, dry eye or corneal ulcers look the same as conjunctivitis without testing. Glucosamine and chondroitin supplements for arthritis can be given to dogs with a very low risk of side effects. Doses are assumed to be similar to that of a human of the same size. Bad Stuff: There is next to no evidence that glucosamine works in pets. Read here about the caregiver placebo effect and more effective arthritis treatments for dogs. Lactulose is a safe and effective laxative suitable for prolonged use in most dogs. It is sold as a liquid in pharmacies and given at approximately one teaspoon per 5kg body weight. The dose is then adjusted to give a faecal consistency neither firm or sloppy. Paraffin oil can also be used at similar doses but must be mixed with food, and is much less suitable for long-term use. Bad Stuff: For every five dogs that owners think are constipated, only one really is. Unless you’re certain (e.g. your dog always gets bound up after chewing a bone) it’s best to confirm the diagnosis first and rule out more serious problems. Severely bound up animals will need a proper enema, and I don’t mean Microlax. Melatonin is commonly advocated as a mild and safe sedative for dogs. Bad Stuff: Evidence is sorely lacking for its efficacy, and the only ‘melatonin’ sold without prescription in Australia is homeopathic. How they can even claim it’s really melatonin is beyond me. There’s very solid evidence for the benefit of omega 3s in dogs. They are proven to reduce signs of dermatitis and may play a role in reducing cardiac arrhythmias. They are safe and often well-tolerated by dogs at a dose of 1 g fish oil per 4-5 kg bodyweight. Bad Stuff: Although they are useful, omega 3 fatty acids do not exert a strong effect in most dogs. Don’t give up too soon though; they can take 3 weeks to show an effect. They should be avoided in dogs prone to pancreatitis. So what can you give a dog for pain? The best of a bad lot is paracetamol, sold as Panadol, Calpol or Tylenol (called acetaminophen in the US). It is sometimes used by vets at a dose of 10 mg/kg twice daily. Bad Stuff: My strong advice is to avoid paracetamol unless it’s impossible to get to a vet. Paracetamol is nowhere near as safe or effective as pain meds made for dogs. It is extremely toxic to cats. Hydrocortisone 0.5% cream (e.g. Dermaid) is available without prescription. It can be used for areas of minor irritation or allergy. Many antifungals (e.g. Canesten) can be used in pets. Bad Stuff: Do not use creams on broken skin, and always be aware of how much is being swallowed by pets. You could easily reach a toxic dose by reapplying creams that are licked off. It’s best to fit an elizabethan collar if using and see your vet if there isn’t rapid improvement. Prolonged use can cause skin damage. Fungal infections in dogs are very unlikely. If it looks like ringworm, it’s usually bacterial. The best thing for this is our magic pink chlorhexidine disinfectant scrub (available OTC). 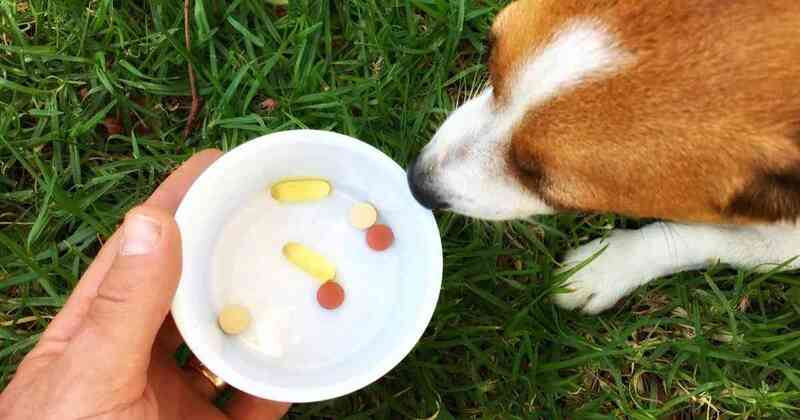 Bad Stuff: Antiemetics & antacids should never be used in dogs without veterinary advice. If your dog is vomiting, there is usually a good reason, and suppressing the vomiting is probably not the best answer. Antacids are used commonly in people but have almost no place in canine medicine. None of these drugs has been properly tested for safety in animals so pet owners need to accept that there may be unknown and possibly serious adverse effects. Always check first with your vet if these medications are suitable for your dog and be very careful if your pet has any other health problem or is on other drugs. Doses in mg/kg are estimates only; a 20kg dog X 2 mg/kg diphenhydramine would receive 40mg. *Why Are Vet Drugs Different? There are four reasons why most animal drugs don’t get used in people and vice versa. By Andrew Spanner BVSc(Hons) MVetStud, a vet in Adelaide, Australia. These blogs are from a series regularly posted on Facebook and Twitter. The information provided here is not intended to be used as a substitute for going to the vet. If your pet is unwell, please seek veterinary attention. i have a product called BRAUER ARNICAEZE (arnica tablets)that i bought for my wife and myself,can i give my dog(JACK RUSSELL)any of these tablets,for his arthritis pains. Hi Josef. I can find no toxicological studies of Arnica in dogs and so I would be very careful using it. Though probably safe, each animal species tends to react differently so it’s hard to say much I’m sorry. Some of this is totally different to the care plan I have for my dog. I thought paracetamol was toxic for dogs as well as cats. My dog is on zantac and nexium. For constipation Metamucil is far safer than lactose. Also Glucosamine is just as bad as fish oils for my dog who gets pancreatitis regularly. Hi Nicole. There are many drugs that should only be used by vets in specific circumstances. Nexium and Zantac are examples of these. This is also true for paracetamol, but I’ve included it just to show that it is an option. We do not believe that glucosamine is efficacious for arthritis in dogs so it is easy to avoid. I suspect in your case the reaction is to other products that are are found together with it. Regarding treatments for constipation, psyllium husk is certainly the best place to start. However, at risk of being repetitive, constipation is over-diagnosed and I would only use these treatments with veterinary guidance. Previous PostPrevious Should My Pet Have Blood Work?